Central Asia presents a unique set of challenges to ending extreme poverty and boosting shared prosperity in a sustainable manner. The region contains numerous disparate geographical features, authoritarian leaning regimes with restricted civil societies, and repressive policies governing individual economic and political participation. Central Asia is also fortuitously located in the center of large international trade routes both historical and current. Recent focus from China highlights the importance of the region in tying large economies together. This presents a unique opportunity to lift the region out of poverty and provide more egalitarian access to prosperity through the reestablishment of the region as a major trade route. With the issues facing the region, it is important to effectively analyze the complex nexus of economic and security interests in the region in an effort to provide contextual understanding to strategies targeted at bettering the lives of individuals in the region. Analyzing and leveraging foreign investment in the region to benefit the populations of the countries of Central Asia rather than the leadership of these countries is a path to alleviating poverty in Central Asia. Security issues, while important and certainly influential, are not the primary obstacle to inclusive economic growth in Central Asia. The region is more stable than the rhetoric of international and regional leaders would suggest. Instead, corruption and other institutional obstacles preventing individuals not connected to leadership from engaging with foreign investment sap growth that would potentially have a large impact on boosting shared prosperity in the region. The leaders of Tajikistan, Uzbekistan, and Turkmenistan use the specter of security issues such as Islamic extremism and potential instability to legitimize their abrogation of civil and economic rights for their populations. The absence of these rights preempts institutional options for individuals to seek greater economic opportunities presented through foreign investment. This absence removes a much-needed path for aggregating the interests of private individuals in society. Strategies targeted at opening civil space for individuals to participate in economic development initiatives is a direct route to inclusive economic growth in the region. Similarly, influencing the focus of larger projects to serve the long term needs of local business development would encourage small business growth that otherwise may be neglected by national leaders in their pursuit of maximizing personal profit. The World Bank is uniquely positioned to engage in such strategies. Tying financial incentives to domestic policy changes to reduce corruption and increase transparency is a strong method to encourage inclusive economic growth and alleviate poverty. Increasing financial assistance for the development of smaller infrastructure projects to tie agricultural producers to better transportation and irrigation infrastructure would also foster greater productivity for the rural population. In addition to this, tying funding to focus on the local impact of infrastructure would strengthen long term inclusive economic growth by connecting local population centers with local businesses and international trade routes. Specifically, supplementing Chinese investment under their Belt and Road Initiative has promising potential. Offering loan packages to supplement infrastructure projects with stipulations regarding primary and secondary routes to tie rural population centers to urban education and business centers is one method to influence negotiations for infrastructure development to achieve multiple goals. 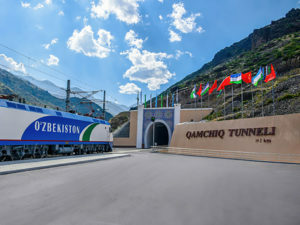 Such stipulations on additional funding would encourage national leaders in Central Asia to negotiate for infrastructure projects that would serve not only to transport goods through the region to increase commerce, but also develop transit corridors to serve as economic multipliers in business centers. Tying rural areas to urban areas would also encourage the development of a more robust tourism industry in Central Asia. At this point, adequate and reliable transportation remains one of the largest barriers to the development of adventure tourism in Tajikistan, Uzbekistan, and Kyrgyzstan. The impetus of Chinese investment in infrastructure in the region provides an opportunity to provide a foundation for the development of this industry that otherwise may go overlooked. Taking advantage of foreign infrastructure development can also be channeled to further develop the education sector in Central Asia. The expansion of current academic facilities to focus on preparing the workforce for running and maintaining the transportation networks envisioned by foreign investors provides an avenue for long term inclusive economic growth in the region. Tajikistan and Kyrgyzstan have been two of the top remittance receiving countries as a percentage of their GDP. Developing local jobs and preparing the workforce for the jobs created by infrastructure development in these countries would provide an avenue for repatriation of their workforces and locally focused, long term, inclusive economic growth. In addition to the benefits of growth, taking advantage of the growing focus on infrastructure development in Central Asia would lay the foundation for more resilient societies in the region. Better infrastructure would make it easier for emergency services and aid to respond quickly and flexibly to migration, environmental disasters, and health crises caused by climate change. Seasonal flooding, mudslides, and earthquakes remain a constant threat in Central Asia, especially in the mountainous regions. Developing multiple transportation routes in these regions would make emergency response more efficient and reduce the economic disruption posed by these events. The myriad challenges present in Central Asia require nuanced and contextual understanding to become the opportunities that they are. The potential impact of World Bank policy is boosted by the focus of international leaders to develop infrastructure in the region. With the right incentives, such investment can focus not only on large scale economic growth, but also on alleviating extreme poverty by 2030 and boosting shared prosperity sustainably through inclusive economic growth.